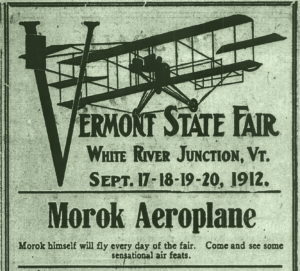 In 1912 it was advertised in several Vermont newspapers that the “Morok Aeroplane”, flown by “Morok himself”, would appear at the Vermont State Fair in White River Junction, September 17 through the 20th. Before entering the field of aviation in 1909, Mr. Morok was known as a dare-devil bicyclist and automobile stunt driver. In 1909 Mr. Morok reportedly flew over Rutland, Vermont, at an altitude of 3,000 feet. Mr. Morok owned an aircraft manufacturing company in Manhattan known as the Morok Aviation Company, (also referred to in the press as the Lord Morok Aeroplane Company), of which John W. Barry was the Director, and A. M. Moses the Treasurer. Although there is some confusion on this issue, it seems the company may have produced aircraft of both the monoplane and biplane type. The number of planes produced is unclear. 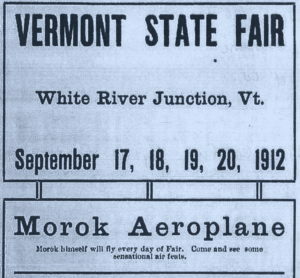 As stated, Charles Morok and his aeroplane were scheduled to appear at the Vermont State Fair beginning September 17th. He’d also been scheduled to appear at the Caledonia County Fair in St. Johnsbury, Vermont, from September 10 through the 13th. unfortunately, he never made it to either event. On July 7th he contracted Typhoid Fever, and fought the disease until August 25th when he passed away at the age of 35. He was survived by his wife, Natahlie, and is buried in Holy Trinity Cemetery in New York City. Furthermore, an accident involving a Morok airplane occurred at an flying exhibition in Colonial Beach, Virginia, on August 21, 1912. It’s unknown if this was the plane that was scheduled to be flown at the Vermont State Fair, or a different one, as Mr. Morok was ill with Typhoid Fever at this time. The aircraft struck a fence and was completely wrecked, and the pilot, Joseph Richter, was injured. Charles Morok was also scheduled to represent Belgium at the International Aviation Race at Chicago, scheduled for September 9th, 1912.